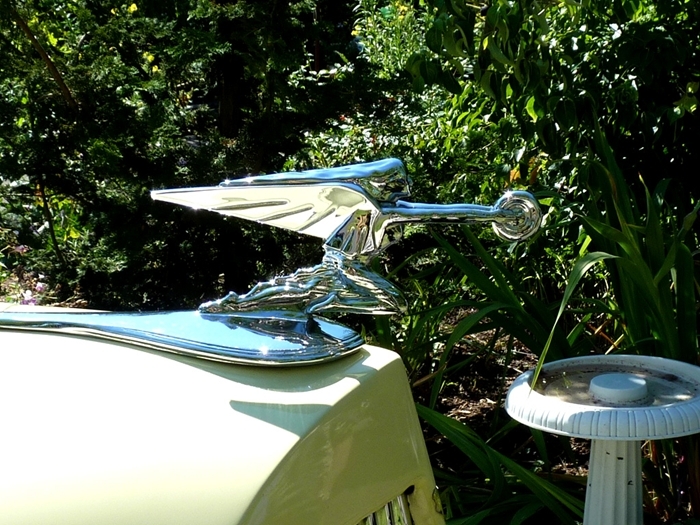 The Packard was yellow when Monte and Elaine purchased it. That is, yellow over red over black. And the yellow enamel created a problem. 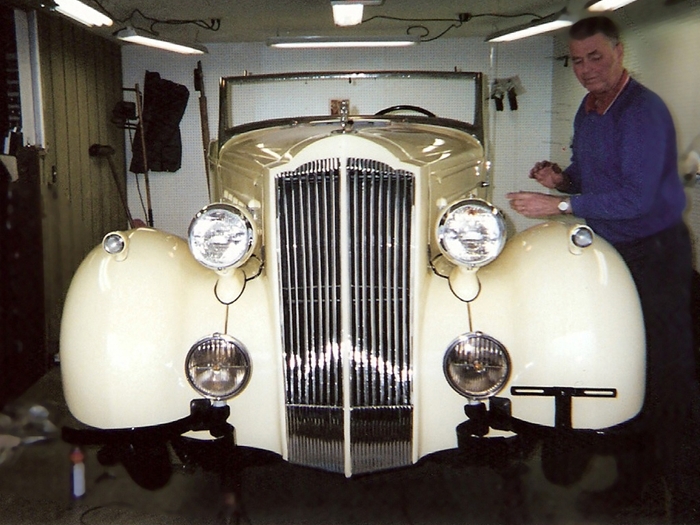 “The previous owner had it painted with enamel over the lacquer, which was not a good thing,” said Monte. 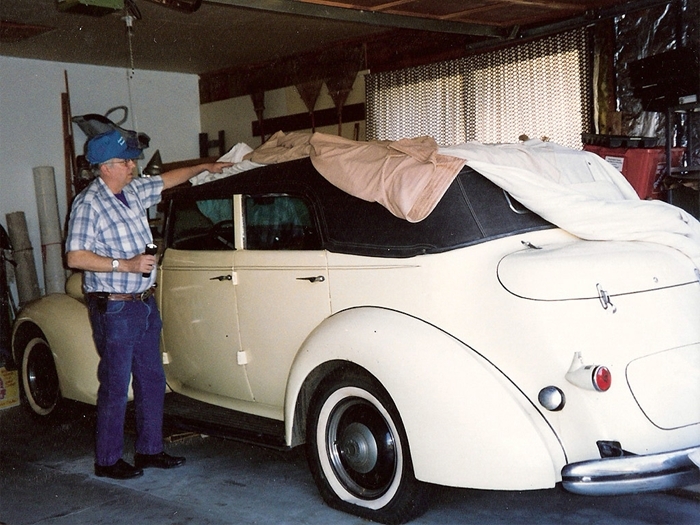 “When I got the car, I could peel the paint off. There were cracks and you could roll it up. 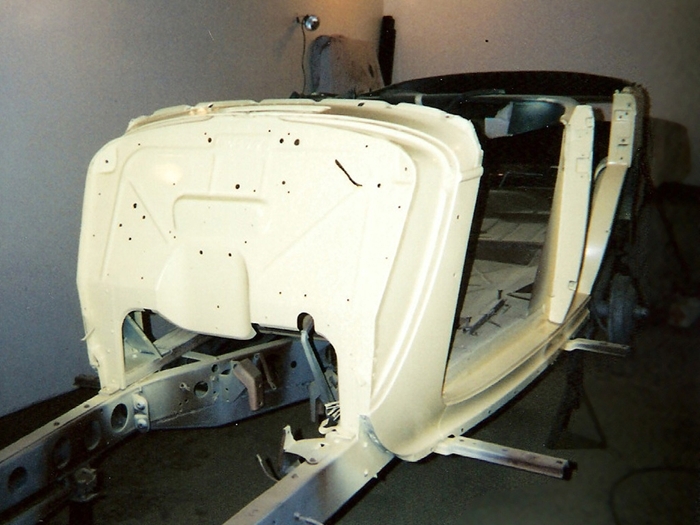 Dave told me, ‘We’re going to fix this.’ and so we took it down to bare metal. 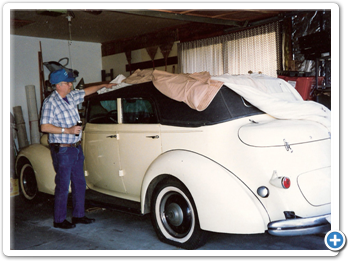 “We discovered the car had been hit twice; once on the passenger side fender and once in the back. 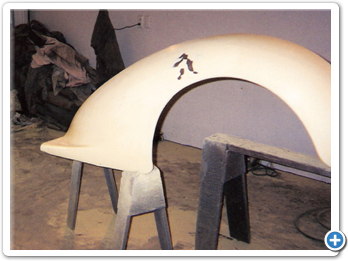 The back body work was really good, but Dave didn’t like the previous work on the right front fender. 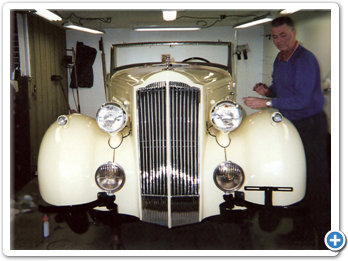 One of Dave’s sayings is: ‘Any car that I restore is not going to look like a washboard!’ So he worked the dent out--it was neat. 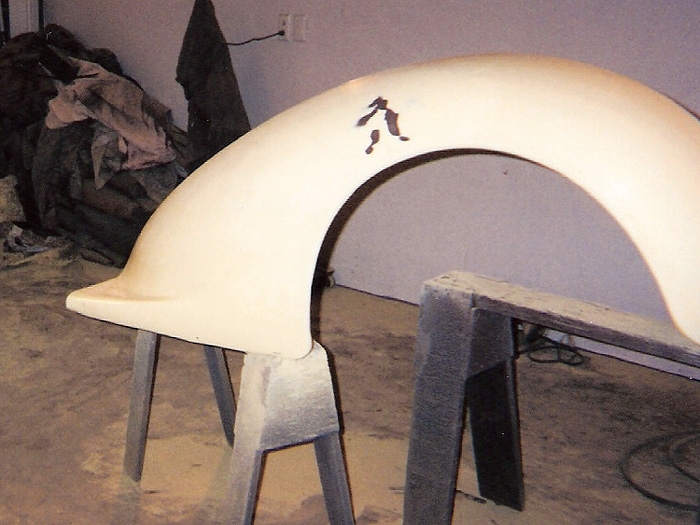 He stretched it, banged on it, and sanded it; if he did that fender once, he did it 20 times, I swear. 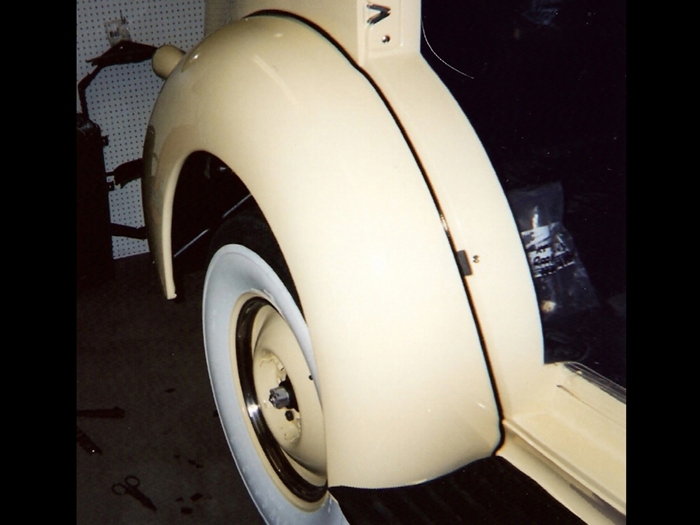 Monte learned that the best tool for installing rear-fender welting is a second set of hands. 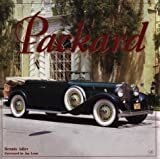 The striking Packard grills of the 1930s often had thermostatically-controlled shutters, which would open when the engine warmed up and close when it cooled back down. 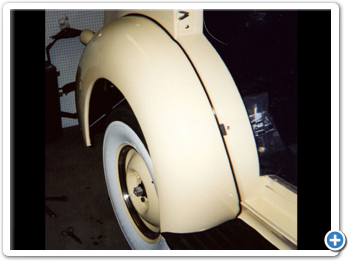 For the 120-B, thermostatic shutters were available only on special order, and this particular car did not have them. 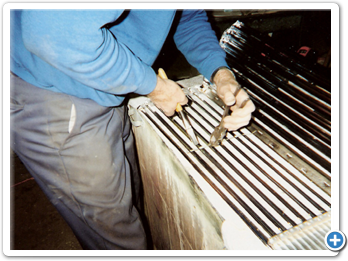 In any case, each vertical bar is held in place by a small square tab of metal. The tabs are slightly twisted to hold the shutters in place. 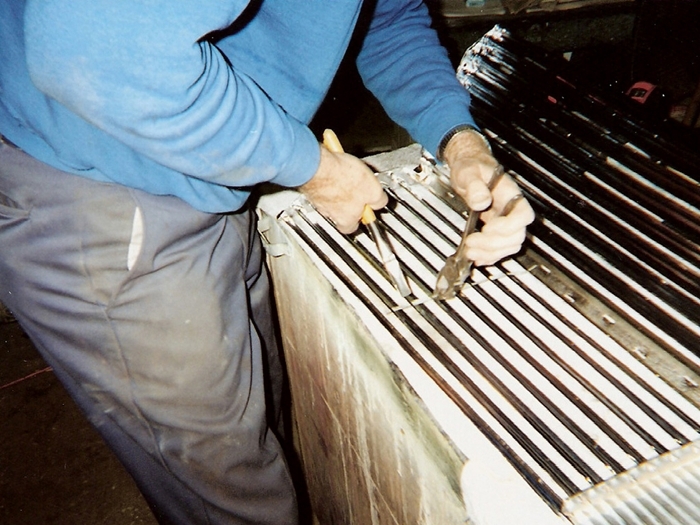 To replate the individual shutters, they must be removed from the grill assembly, a tricky task. 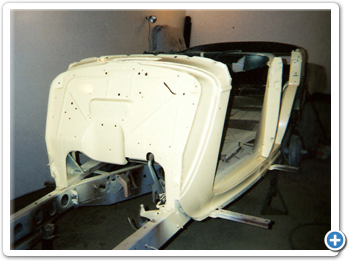 One of the biggest challenges of a restoration is getting radiator shell, front fenders, and hood to align with each other and the body. 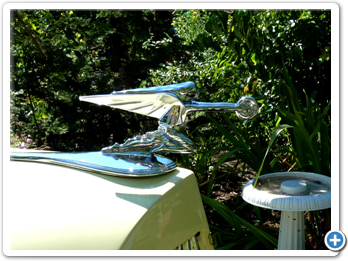 In Monte’s case it was even more difficult because the radiator cradle had been altered.